The Tuesday Afternoon Book Club will meet Tuesday, October 20th at 2 pm. 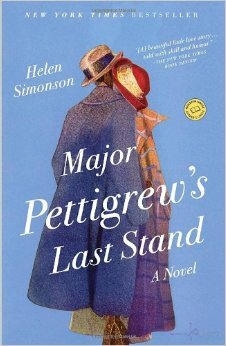 This month we’re discussing Major Pettigrew’s Last Stand, “a wise comedy about the unexpected miracle of later-life love”. Helen Simonson’s debut novel became an international bestseller when it was published in 2010. When Major Pettigrew, a retired British army major in a small English village, embarks on an unexpected friendship with the widowed Mrs. Ali, who runs the local shop, trouble erupts to disturb the bucolic serenity of the village and of the Major’s carefully regimented life. As the Major and Mrs. Ali discover just how much they have in common, including an educated background and a shared love of books, they must struggle to understand what it means to belong and how far the obligations of family and tradition can be set aside for personal freedom. Meanwhile, the village itself, lost in its petty prejudices and traditions, may not see its own destruction coming.